Mar phríomhoide Ghael-Choláiste Chill Dara is mór an ónóir dom fáilte a chur romhaibh chuig ár suíomh gréasáin nua. Is údar mór bróid dom bheith páirteach sa scoilphobail seo go háirithe nuair a fheicim daltaí óga ag teacht agus ag imeacht mar dhaoine sona, muiníneacha, agus iad ina mná agus ina bhfir fiosracha, meáite chun barr a gcumas a a bhaint amach, chun barr feabhais a bhaint amach i bpé rud a dhéanann siad agus réidh chun páirt dearfach a ghlacadh sa saol mór. 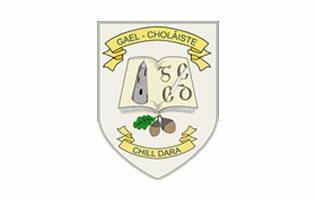 As principal of Gael-Choláiste Chill Dara it gives me great pleasure to welcome you to our new website. I am proud to be part of this school community especially when I witness young students enter and leave as happy, confident, enquiring young women and men, determined to reach their potential, to excel in whatever they do and destined to make a positive contribution to the world.